Hearts manager Gary Locke celebrated his fourth Edinburgh derby win of the season before issuing a plea to have his future clarified. 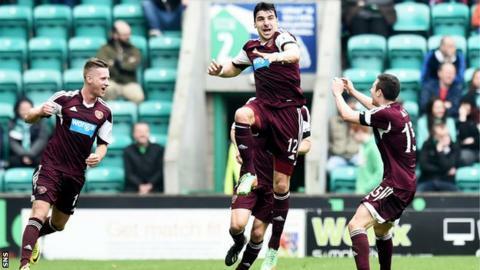 Callum Paterson scored with two headers as Locke's side beat Hibernian 2-1. The Tynecastle club are in the process of coming out of administration, with businesswoman Ann Budge nearing a takeover. "I'd like to know what's happening," Locke told BBC Scotland following the win at Easter Road. "Hopefully Ann comes in sooner rather than later because we are getting to the end of the season and we would like to get everything sorted out, especially for my own future. "Ann's worked tirelessly behind the scene. She's said all along she's not going to make decisions until she owns the football club and that's fine by me. "I've been through everything, I don't think there's anything else that could be thrown at me that I've not already faced. "I've made mistakes, I'm a young manager. I'm learning all the time, I learn every day. "But I hope I've come out of this a better manager a better person and if that's the case, I'm delighted with that. "I'm manager of the football club that I've supported all my life so I see every day as a special day. Hopefully it can continue. If not, I can always say that I did my best." Locke praised double goalscorer Paterson, who started the season as a striker but has featured in defence in recent weeks. "Callum's been great," said Locke. "He's played all over the place. "Coming through the youth system, he played every position possible, apart from goalkeeper. "Callum, who sees his long-term future at right-back, has done very well there and we're delighted that he got two goals for us. "We played well first half. Second half, Hibs were the better side. "We've showed a different side to our character. In the last month, we've won games and played really well. Today was more about character and digging in and I think you saw that in abundance. "Hibs have got good players, they've got a good management team. Everybody's writing them off. I knew that they would make it difficult for us. "They did make the game physical. I'm delighted that our players have stood up to that because maybe earlier in the season that wouldn't have been the case. "You can definitely see that we're physically better and fitter and the younger lads are handling themselves a lot better now."